JEREMY Corbyn is under mounting pressure to resign amid Labour's spiralling anti-Semitism crisis after Jewish campaigners said fresh revelations prove he has long-held racist views. An unearthed speech by the veteran leftie appears to see him breach part of the internationally-recognised definition of Jew hatred after comparing Israel to Nazi Germany. In another shocking clip he praises the release of 1,000 Hamas "brothers" who killed 600 people, including a terrorist handed seven life sentences. It has led to suggestions the reason Labour watered down their controversial rules on what constitutes anti-Semitism was so that their own leader does not fall foul of them. Further damaging claims in a dark week for Mr Corbyn include that he chaired a meeting in Parliament comparing Israel’s actions to the Nazis. And that during the meeting an elderly Holocaust survivor was blocked from talking, as the Labour boss - then a backbencher - ordered pro-Israel protesters to leave, something he rejects. The newly-dug up speech from 2010 sees him liken the plight of those living in Gaza to the “siege of Leningrad and Stalingrad” by the Nazis. Labour’s anti-Semitism crisis has blown back into the open after they omitted several examples of Jew hate from the International Holocaust Remembrance Alliance’s working definition of it. One of those, which have been adopted by organisations and countries around the world, is about “drawing comparisons of contemporary Israeli policy to that of the Nazis”. A long line of Labour councillors and other members of the party have been investigated for saying Israel is acting like the Nazis. But now the video of Mr Corbyn sees him seeming to do the same thing – although a spokesman denied he was drawing such a comparison. In the clip he said: “Three months ago I saw the mortar shells that had gone through the school buildings, that destroyed UN establishments, the burnt out schools. “The ruined homes, the destroyed lives, the imprisoned people, the psychological damage to a whole generation who’ve been imprisoned for as long as the siege of Leningrad and Stalingrad took place. The siege of Leningrad, which lasted for 900 days during World War Two, saw the Russian city blockaded by the Nazis and resulted in the deaths of a million and saw almost two and half million left sick or wounded. In response to the video the campaign group Labour Against Antisemitism said Mr Corbyn’s comments would fall foul of the code if it was fully accepted. Spokesperson Euan Philipps said: "In this speech Jeremy Corbyn describes Israel’s actions during its ongoing Palestinian conflict as being similar to the sieges of Stalingrad and Leningrad during the Second World War. "In doing so he appears to be comparing Israel to Nazism, a notion that most Jews would find very offensive due to the Holocaust. "The IHRA definition states that drawing comparisons of contemporary Israeli policy to that of the Nazis is anti-Semitic. "It looks increasingly clear that if the IHRA definition were re-adopted by the Labour Party then Jeremy Corbyn might himself be suspended - and even face expulsion. Is that why it is being so strongly resisted?" 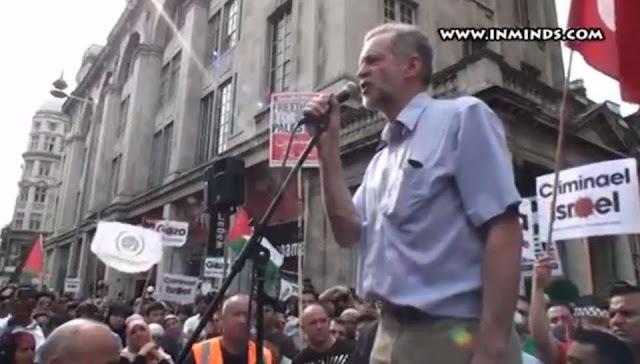 There are other examples of when Mr Corbyn may have fallen foul of the IHRA code, after writing a column in 2008 for The Morning Star where he referred to the "Gaza Holocaust". He later likened the Palestinian cause to that of the Spanish fighting against General Franco's Nazi-supported forces. But it doesn’t say whether previous cases of comparing Israel to the Nazis would lead to a party investigation in future. After it was revealed Mr Corbyn had hosted the event in Parliament the Jewish Labour MP Louise Ellman said it had made her wonder “if this is the reason that the Labour Party wanted to dilute the definition in this way”. But a spokesman for Labour denied Mr Corbyn’s comments were about drawing a direct link between the actions of the Nazis in Russia and Israel in Gaza.